The Cross and Crown design has long been used by The First Church of Christ, Scientist, as a legally protected trademark. However, the design combination of the cross and crown is not unique to Christian Science; both Protestant and Catholic churches have used it. For example, the cross and crown was printed on the cover of the book of church rules in use in the Congregational Church in Concord, New Hampshire. This was probably Mary Baker Eddy’s first encounter with the symbol. Earliest known use of a Cross and Crown design by Eddy. In 1875 or 1876, Eddy used the cross and crown on the sign on her home at 12 Broad Street in Lynn, Massachusetts. The sign read “Mary B. Glover’s Christian Scientists’ Home” framed with an image of the cross and crown and an open book. This cross and crown was different, however, from the Cross and Crown seal that would appear later on her books; the crown was above the cross and it was not encircled with Biblical text. Eddy first used the Cross and Crown seal on the cover of the third edition of the Christian Science textbook, Science and Health with Key to the Scriptures, issued in 1881. Nothing has been located that explains her reason for choosing this design. The wording of the scriptural passage from Matthew 10:8 is quoted from the Revised Version of the Bible; however, the word “demons” comes from the marginal notes of the Revised Version, which shows “demons” as the Greek word for “devils.” Initiated by the Church of England, the New Testament (Revised Version) was published in 1881, a few months before Eddy put the Cross and Crown on the cover of Science and Health. 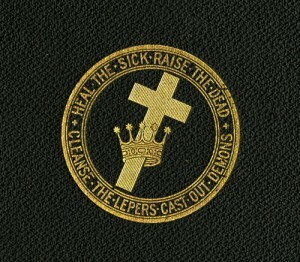 An 1881 incarnation of the Cross and Crown logo. When it was found that the crown used in the emblem was not a crown but a princely (as opposed to kingly) form known as a coronet and therefore possessing no religious significance when combined with the cross, the coronet was changed to a celestial or Christian’s crown in 1908.1 The design was slightly modernized in 1971. The cross and crown design with concentric circles and scripture text is a design trademark owned by the Christian Science Board of Directors. The specific Cross and Crown design within the concentric circles and the wording has been registered by the Christian Science Board of Directors as a trademark. This was first done after Eddy’s passing, in 1916. While this trademark was never formally registered in Eddy’s lifetime, it was certainly recognized as one. Incidentally, it’s often thought that Eddy felt the seal must invariably have a particular placement on the binding of her books. There is no such indication in the records. It’s interesting to note, for example, that the Cross and Crown did not appear on the binding or the title page of the Church Manual until 1916, after Eddy’s passing. Archibald McLellan, “The Cross and Crown,” The Christian Science Journal, June 1908, http://journal.christianscience.com/shared/view/10or8spczdw?s=t.